I’ll admit it. I love beans in almost any form. I’m not too crazy about limas unless they’re fresh and my dear friend Mrs. Diane makes them. 😉 I’m not sure which bean is my favorite but lentil beans rank right up there with a big ole pot of pintos cooked with a ham bone. I love that lentils are so versatile. Some of my favorite recipes are lentil soup, lentil tacos and lentil spaghetti. 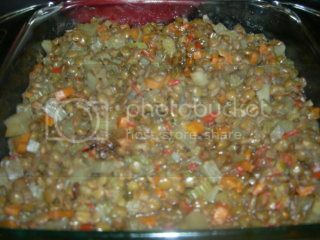 One slightly unusual lentil recipe we love is Honey Baked Lentils. It takes a few minutes to prep the veggies but then you throw everything in a casserole dish and pop it in the oven. If you’re trying to eat a little healthier but are craving the comfort of a casserole this recipe fits the bill. I like to get all the ingredients out first. Oops, forgot a couple of things. Did you see that red pepper? 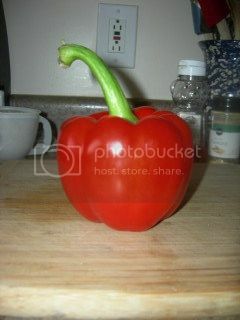 That is one pretty pepper! The kids didn’t want me to cut it up. 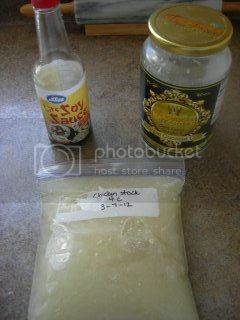 The basic recipe came from the Mothering Forums. That’s it for the basic recipe. 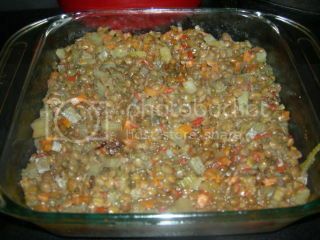 Mix and bake on 350 until the lentils are tender which takes about an hour and a half. It’s cold and rainy in New York today (what happened to spring??). We might have to enjoy this recipe again tonight! sounds yummy! 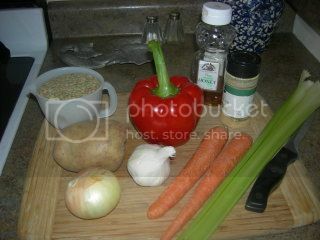 I have some lentils in there, might be trying this soon. We are bean fans too!